I’ve always been fascinated by the way foreign directors represent Russia in films and the codes that were supposed to bring a Russian setting to life. These movie-makers must have read some pieces of classic Russian literature: the majority of signs and symbols that are supposed to connote Russia turn out to be a director’s representation of the codes rather than the codes themselves, a web of signifiers realising an imaginary Russia. Most of the codes have been repeated endlessly becoming clichés easily recognized Russian audiences, making the cinema burst out with laughter. The limited number and repetition of these codes exaggerate the ‘Russianness’ of the context and put the story in another dramatic perspective: grotesque. The grotesque is still common on stage as a respected classic Russian drama school approach, so it happily lives within the theatre, rarely appearing elsewhere. The Russian spectator does not expect to see the grotesque on screen, nor did the Hollywood director, I suppose, intend to use this style of representation on purpose. This study will deconstruct myths about 19th century Russia, as shown in films and appearing in popular culture. Apart from the usual exaggeration, you can notice the lack of understanding of the difference between the nobles and the peasants of pre-revolutionary Russia. There was a huge cultural gap between these two classes in customs, traditions and beliefs, determined by serfdom, which existed in the country for several centuries and was eliminated only in 1861. Once can find a limited overlap between the cultural systems of the ‘noble’ and the ‘peasant’ worlds, but in general they were like two planets in one galaxy, where the Tsar was certainly treated as a sun. Although stressing the point of difference might seem intolerant in today’s multicultural reality, it is necessary to be accurate with the description of the way people lived, at least for the sake of future generations. As George Santayana once said, ‘Those who do not remember history are condemned to repeat it’. So, it’s better to clearly see and depict social segregation and its consequences, i.e. its impact on the nature of symbolic systems, instead of mixing all elements of national/cultural specifics in one pot. Why true: Russians did wear fur to keep warm. 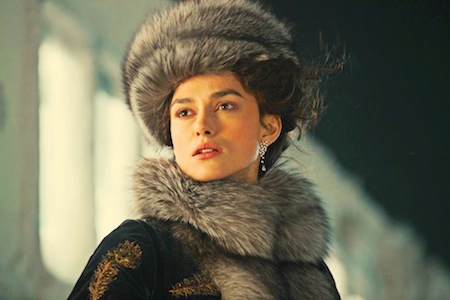 Why NOT true: Nobles of 19th century chose fine silvery sable, which looks different from other furs and is rarely shown in films; big and heavy fur coats were popular among merchants and their wives, but not the nobles. Why true: Vodka was very popular in those days and its production was also in hands of nobles. Why NOT true: Pure transparent vodka was never drunk those days, it was used in production as a base for creation of more delicate drinks. People preferred to make and drink berry and herbal ‘vodkas’ differentiated from each other by colour and taste. Why true: In winter when snow is all around – on the ground, on trees and in the air – the sky may be covered by clouds and seem absolutely white. This weather is typical when it’s not that cold outside but at the same time quite wet. Why NOT true: Back then when winters were very frosty and cold the most common weather was ‘frost and sun’, as Pushkin described it – bright blue sky, no clouds and the ground covered with shiny sparkling snow. Why true: All peasant women wore plaits which were treated as marks of beauty. Besides, by plait thickness and length, men judged woman’s physical strength and health. Why NOT true: The plait was typical for the village women: on the one hand, peasant women needed to prevent their hair from getting in the way when they were working in fields or at home; and on the other hand these women needed a symbol of beauty they could display. Noble women wore plaits in the 15th century but later on they preferred more complex hair styling. Being subject to French fashion they never let their hair look loose or hang down freely in a plait. Why true: Was popular in big cities, took place on the surface of the rivers, and Russia is traditionally a land of rivers (that’s why actually all roads in the country are known to be in a very bad condition: there was never a need for them and native people still have not developed skills in road construction). Why NOT true: A river’s surface is not smooth, so skating was not as elegant as ishown in films. In the19th century only two artificial skate rinks existed, in St Petersburg and Moscow. Sledging, incidentally, snowball fights and building a snowmen were more common and easier to do. Why true: Russian ‘Troika’ (literally: ‘three’, i.e. 3 horses) is a symbol of such phenomena as freedom, the inner search and a long road ahead. In reality, this was also one of the most popular forms of carriage. Why NOT true: Other kinds of carriages also existed and were commonly used: nobles could use even 6 horses pulling their carriage. A troika with black horses is more of an exclusion: breeds of white, brown and grey horse were more widespread. ‘Apples on grey’, horses of light grey color with yellowish spots, were the true Russian luxury. Why true: An authentic example of folk craft, manufactured since the end of 18th century. This unique rural Russian fabric patterning is still available, and trendy among hip young women. Why NOT true: Never worn by noble women, only peasants. Why true: There are some famous churches with colourful onion domes (especially popular with tourists). in Russia’s big cities. Why NOT true: None of these ‘colourful’ churches had the status of a major or state cathedral. The latter were big and brutal, without the playful image of picturesque ice-cream-like domes. Moreover, small, white stone and wooden churches played a more significant role in the religious life of Russians of those times: so if a person felt like having an intimate rendez-vous with God, he or she would have preferred to go to a small church and hide from the eyes of others. This list could certainly be extended. 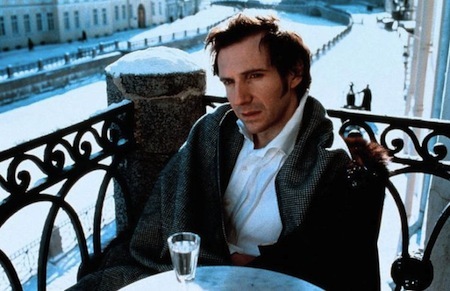 All these codes may be discovered in such films as ‘Onegin’ starring Liv Tyler and Ralph Fiennes, British TV-series like ‘Crime and Punishment’, several adaptations of ‘War and Peace’ and coming soon ‘Anna Karenina’ directed by John Wright. My favorite personification of Russia is Princess Sasha from the adaptation of Virginia Woolf’s masterpiece ‘Orlando’. She’s absolutely amazing wearing her fur hat with giant fake sapphires, a thick brunette plait and with a possessive look in her eyes. Yet, it’s not difficult to see that she’s 100% French: she has absolutely non-Russian facial features. This is a perfect example that it’s not enough to be aware only of the cultural codes, and that three things are much to be desired – real attention to detail, consistency with historical truths and contradictions, and a sense of proportion. Sorry for the delay in my reply: for some reason I’ve just noticed it. I wrote something on stereotypes of Russians in the UK and spoke at a Russia Mind event on it too. Let me know if you want me to send you my presentation.